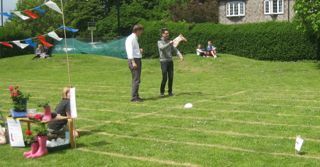 Welly Wanging - The sport of true Olympians! Do you want a really easy fundraising idea? A time honoured part of any village fete. Welcome to a weird and wonderful world! Where does it come from?------ Nobody knows! Who first started it?-------------- Nobody knows! Why do we love it?--------------- Nobody knows! Do we want it at our fete?------ You bet! Ok so no-one really knows who first thought up a competition to see who can throw a wellington boot the farthest. Nor why the idea took off and has become so popular. All we know is that this traditional part of the village fete is loads of fun and a great money spinner. Competitors (and it can get very competitive!) pay a fee and throw a welly as far as they can down the course. The spot where the boot lands is marked and at the end of the day the farthest mark wins. It doesn't come much simpler than this! Of course there are different techniques and strategies for gaining maximum height and distance! There is indeed something Olympian in watching a welly leave the hands of an expert and make a graceful arc in the sky. Maybe you should get practising! Add to the excitement and competitive nature of "The Wangers" by having a prominently displayed leader board. At the end of the day you present the "Golden Welly" to the champion wanger! Don't forget the kids. What about a seperate competition with a smaller welly for under 12's? The Toddler Welly Wang Challenge is another surefire winner. 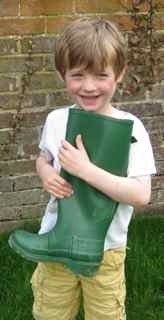 How could any parent resist getting their pride and joy to demonstrate how to launch a little rubber boot or two! Another option, and test of wanging skill, is to have some circles marked out on the course. Land a welly in the circle to win a prize. 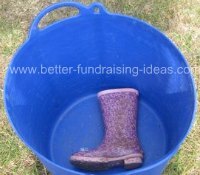 Or what about landing a kid's welly in a strategically placed bucket. There really are all sorts of possibilities. It seems unthinkable but some fundraisers are turning their backs on tradition. Rubber Chicken Chucking is the latest craze at village fetes throughout the land! 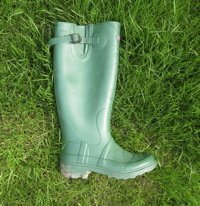 For guaranteed fundraising success - Let the wellies fly!